Brisbane writer and editor Peter M. Ball has inspired me to stop procrastinating and join his Sunday Circle. This is my first Sunday Circle post but I do hope to make it a regular thing. 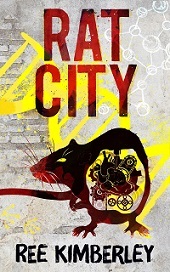 I’m almost halfway through a draft of Rise of the Rat Generation, which is the 2nd book in my young adult speculative fiction series, Generation Rat. It’s going reasonably well, although sometimes I wish I was more of a plotter than a pantser. But plotting has never worked well for my writing style. Being a pantser seems to give me more freedom to just go with what comes out on the page. I’ve also started a new horror story based on, strangely enough, an avocado set I saw in an op shop (second hand shop). I’m really not sure what drew me to this object, perhaps just the 1970s era strangeness of having a set of serving ware specifically for avocados, but building a story around it has been surprisingly easy. 2. What’s inspiring me this week? This conjures for me images of Alien, for starters, but so much more. We tend to think we own and control our bodies, although every day this is proven to be false. Our bodies “do” things to us all the time that frustrate us, and cause us anguish, pain and terror. This is fertile territory for horror writers. 3. What part of my project am I avoiding? The blank page, always the blank page. I know there is only one way to fill it up but I have a myriad of ways to avoid it before telling myself sternly to knuckle down. When it comes to sitting down and writing I’m a bit like a dog trying to settle into its bed. It takes a while of circling, wriggling and moving around until I’m finally comfortable. But once I’m settled, it’s all good. Sunday Circle image is a photograph of a piece of street art I took in Sete, France in 2015 (artist unknown).